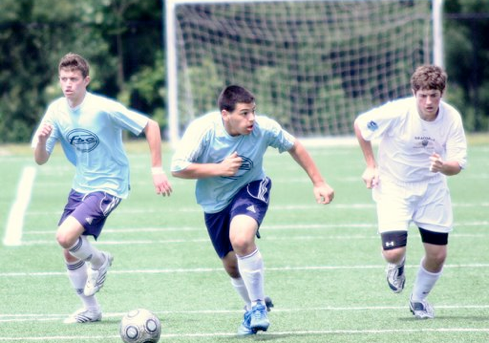 Foundation Soccer Club was formed in 1997 with just 28 kids on two indoor soccer teams. Since then we have grown to nearly 200 active players on boys’ and girls’ teams in many age groups and competitive levels, playing year round out of New Britain, CT. FSC players have been selected for the Olympic Development Program, have earned college scholarships and have even pursued professional playing careers. One of FSC’s original objectives was to identify players with the talent and determination to improve and succeed, and to provide them with a more challenging development environment than might otherwise be available to them. We seek high quality competition and work to ensure that players learn and develop from every encounter; we offer ample individual instruction to our players, both general and position-specific, which will help them succeed with our team and with any other teams in the future; and we offer a comprehensive team development approach, by which each player’s improvement leads to even greater improvement on the part of the team. Our goals are to provide a complete soccer experience, including tournaments, trips to pro games and national team matches, and college placement assistance; to emphasize intelligent, skillful, and team oriented soccer rather than purely physical play; and to help our players learn to love the game as much as we do. Most importantly, we aim to help every player reach his or her full potential as an athlete and as a person, and we have a great time in the process.